• Locate the green facade on the elevations exposed to the highest daily temperatures. 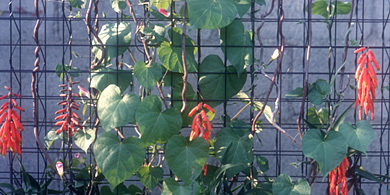 • Design for maximum leaf area and shade to the building wall. • Select the optimal plant palette for maximum coverage and density in your microclimate. • Provide for the maximum depth of soil beds or containers to ensure good coverage. • Structure the facade system around air intake grilles. summer and allow solar warming in the cooler months. • Locate the living wall on the elevations exposed to the highest daily temperatures. • Provide waterproof membrane to protect the building skin if not built into LW system. • Select plant species for maximum coverage and density with maintenance costs in mind. • Design adequate irrigation supply and drainage according to species and orientation.